Denon DCD-710AE review | What Hi-Fi? The only Denon disc-spinners we've come across in the past few months have been the Blu-ray-playing variety. So it's nice to get to grips with a new two-channel deck. The styling is similar to that of the company's Blu-ray machines, but that's no bad thing. The partly sloping fascia, tidy button arrangement and black finish give the '710AE a very sophisticated air. The player uses Denon's vibration and noise-resistant design that boasts extra rigidity and shorter signal paths. The USB input on the front allows you to play WMA and MP3 digital music files; it also works with (and charges) your iPod or iPhone. And, the control system works very well. The remote control has dedicated keys that help you to scroll through the iPod menus and select tracks. Granted, you need to be in close proximity to the iPod's screen to make the most of this functionality, but it's a nice touch and tunes played through the input sound enjoyable enough. ‘Enjoyable enough' is a phrase that you'll find yourself using after spending some time in the company of the '710AE. Which is strange, because if you're looking for gaping holes in the Denon's sonic ability, you're hard-pressed to find them. 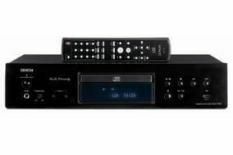 It does a fine job at unravelling layers of detail; the clarity and insight on offer is a match for the likes of the Cambridge Audio Azur 650C, with no trace of coloration in the midrange, brightness in the treble or looseness in the bass. The '710AE handles the heavy bassline of Notorious BIG's Mo Money Mo Problems with great aplomb. Vocals sound clear and detailed and the machine shows no sign of a struggle keeping up with the frisky tempo of Diana Ross' I'm Coming Out sample. Switch to more classical music, and it's easier to pinpoint an area where the class-leaders have an edge. The first 30 seconds of the Theme From Jurassic Park are handled confidently enough, but, just as you expect the music to blossom, the Denon holds back. This dynamic flaw means the player struggles to keep you entertained long-term and, although there's nothing offensive about its overall character, this niggle is enough to hold the Denon to a four-star rating.